The item Annihilation Conquest, Book One, Dan Abnett, Andy Lanning, Keith Giffen, Christos Gage, Michael Hoskin, (electronic resource) represents a specific, individual, material embodiment of a distinct intellectual or artistic creation found in Lawrence Public Library. 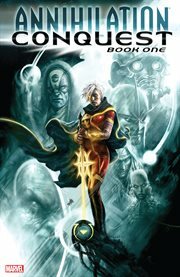 Collects Annihilation: Conquest Prologue, Annihilation: Conquest - Quasar #1-4 &Annihilation: Conquest - Starlord #1-4. What is next for the battle-weary heroes known as Nova, Peter Quill and Quasar? Which cosmic characters of the past are about to return? Who is the new hero approaching on the horizon? And what happens when Ultron makes a play to control the universe?